ETERNAL ENCOURAGEMENT | BY HIS GRACE HE GAVE US ETERNAL ENCOURAGEMENT! BY HIS GRACE HE GAVE US ETERNAL ENCOURAGEMENT! Last night, with our grandkids, we were spellbound watching some videos of Nick Vujicic of “Life without Limbs”. Nick was born in 1982 in Australia without arms and legs. He has an amazing story of hope and redemption in Jesus that he’s shared in over 60 countries to many thousands of people. He is a motivational speaker and evangelist. His videos are captivating. Besides watching him skydive and surf, we saw him speaking to crowds of teenagers and stadiums full to capacity. Curious, five-year-old, Kayra asked, “Why was he made like that?” to which Milos immediately replied in a big-brotherly way: “Because God does ‘bad things’ so people can hear about Jesus.” I almost gasped out loud, thinking that there was such deep theological truth packed in that statement, and that a child unpacked it! God wants everyone to hear about Jesus. And yes, sometimes ‘bad things’ happen so that they can. Milos was right! This morning as I was reading in Acts 9:32-35, I saw that truth in the early church. We read that Peter “found a certain man named Aeneas, who had been bedridden eight years and was paralyzed. And Peter said to him, “Aeneas, Jesus the Christ heals you. Arise and make your bed.” Then he arose immediately. So all who dwelt at Lydda and Sharon saw him and turned to the Lord.” That jumped off the page. Bedridden…paralyzed…healed…all who saw him turned to the Lord! There are other ‘bad things’ that happened in the Bible that caused people to hear about Jesus. We can read of the blind man in John 9. Because of him, Jesus presented Himself as “The Light of the World.” He is still lighting up the world, even now. If you have had ‘bad things’ happen to you, or you struggle with ‘bad things’ right now, think Biblically. God just may have allowed those circumstances in your life so that others can hear about Jesus. Check out Nick’s website and be encouraged! www.lifewithoutlimbs.org. Raise your hand if you ever made a New Year’s resolution that you kept all year. Yep. Just what I thought. I didn’t see any hands raised. We can make the most important resolutions, and have the best intentions, but we fail to keep them. For the believer in Jesus Christ, starting the New Year isn’t about making resolutions and trying to keep them. It is about acknowledging Him in all our ways and letting Him direct our paths. It’s asking God for guidance and letting Him do what has to be done in and through us so that He gets the glory. Let’s re-think our resolutions. Maybe the only resolution we should consider is submitting to God’s plan! Looking at our worn “WELCOME” mat as I was sweeping the front porch two hours before expecting dinner guests, I thought, “Hmmm…this is embarrassing!” My gut reaction was to race to the store to buy a new one at some point after pulling the dessert from the oven and peeling potatoes for our goulash; but then, I probably wouldn’t have time. 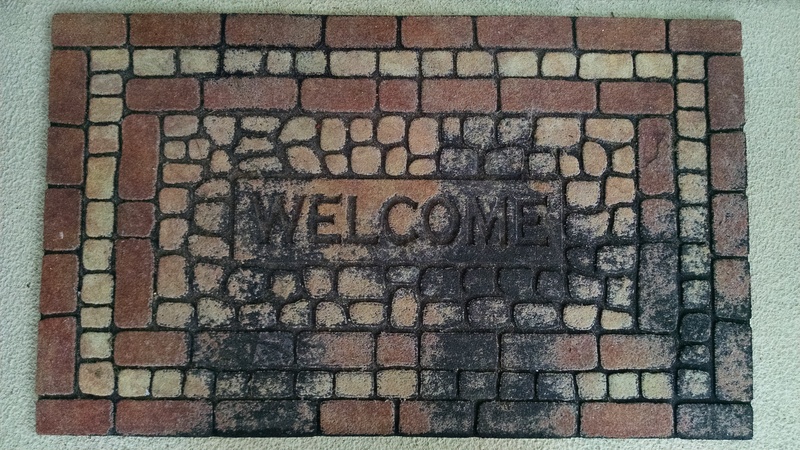 So I began to reason with myself: A worn out “WELCOME” mat is a good thing. It is proof that we’ve been blessed with a lot of friends, and we are very grateful for each of them. My thoughts kept wandering…some of those friends have moved out of town, out of state, or even on to eternity with Jesus. Some live in other countries, and we are thankful for the bond of friendship that holds us together in spite of time and distance. Maybe you’re one of our friends whose coming and going helped wear out our “WELCOME” mat. Thank you so much for your visit! Or maybe you are a friend – or future friend – who hasn’t come see us yet. Drop in sometime! You are always….WELCOME! The embarrassment that I felt for having a worn out “WELCOME” mat gradually turned into gratefulness, and now I consider it a treasure. It’s a good thing. In fact, I think I’ll keep it a little longer as a reminder of the value of friendship. The future can be scary. No one can be 100% sure, when leaving home in the morning, that they’ll return. Our lives can be changed forever with a phone call or an unexpected event. If we dwell on uncertainty, we’ll quickly spiral down in a vortex of worry and anxiety – to a place no one wants to be. As we step into a new year, let’s remember that no matter what, our God gives assurance for the future! AMEN! So sorry, I forgot to add the last “S” to this prior to posting it. Here’s the complete acronym that was posted yesterday. Merry Christmas! H – HOLY ONE OF GOD: John 6:69 – “…You have the words of eternal life,…you are the Holy One of God. Please feel free to share this important message with others to help keep CHRIST in CHRISTMAS! We could all make a list of important people; those who’ve had a significant impact on mankind. But who makes a list of ordinary people? Probably no one; but they’re ones that see a need and get to work. That happened all throughout Christ’s ministry. Let’s look at some ordinary folk who made a tremendous difference. Four men carried their paralytic friend through the crowds, somehow managed to get him up on top of the house, tore off the roof and lowered that friend to be close to Jesus. (Mark 2:1-12) They knew that Jesus had power to heal. Because of their faith, the paralytic was not only healed, but forgiven. Ordinary friends put their faith to work because they believed in the power of Jesus. The little boy who shared his lunch (John 6:1-14) is the only miracle of Jesus that is recounted in all four Gospels. When his mom packed the 5 loaves and 2 fish that morning, she never thought that they would be the catalyst for Christ to be recognized as “the Prophet who is to come into the world.” (v.14)…or that her young son’s selfless giving would be an example to thousands, throughout millennia! There are opportunities all around us to put our faith to work and obey God by selflessly serving others. Let’s be on the lookout for them. We are just ordinary people …the kind our God uses! Join me every Monday of 2016 as I share more of what I discover on my quest to know God better. James Cameron, an explorer and filmmaker for National Geographic, was the first human to make the 2 hour, 36 minute descent into the deepest part of the ocean in March of 2012. At the depth of 8.6 miles, he saw what you and I will never be able to see in the Mariana Trench…but God can see it. He created it. Our God alone can see our heart, too. Think about your heart and meditate on what God says about it. On Mother’s Day, Father’s Day, Memorial Day and Veteran’s Day we honor very special people and express our gratitude for their love and sacrifice. They all have a special day…but shouldn’t we ALWAYS be thankful for them? We just celebrated Thanksgiving Day. Is one day enough to thank God for all He does for us and for all he gives us? Of course not! We all know that God deserves our thanks more than one day a year! You get the idea. So as you dig for another recipe for leftover turkey, take a minute to make your own “ALWAYS GIVE THANKS” list. Let’s all expand our thanksgiving beyond the holiday and cultivate a thankful attitude every day, because our God ALWAYS deserves thanks! Join me each Monday in 2016 to share more of what I’m finding on my quest to know God better. Psalm 136 is that perfect reminder. It starts with “Oh, give thanks to the Lord”, and continues with the fundamental reason: “for He is good! For His mercy (steadfast love) endures forever.” Then the Psalmist gives us a list of reasons to thank Him: He is the God of gods, supreme, powerful, wise, the Creator; He is perfect, the source of light; He has power over death and nature, He is our deliverer and He is victorious. God guides and protects us, and He is sovereign, the owner of everything. God is faithful to keep His word. He cares for us, is concerned about us and is our compassionate provider and Savior. Who hasn’t felt the frustration of waiting for someone? A slowpoke on the highway, a child who’s dragging their feet; a coworker who has to finish their part of a project before we can start ours…we fidget and fume; we allow our wait to turn nightmarish. Maybe you’re waiting for God to resolve a situation or answer a prayer. It seems that He’s not budging and your frustration mounts. God is not in a hurry. What if you would let God turn your wait into a positive experience? In His Word we are assured that “The Lord is good to those who wait for Him.” (Lamentations 3:25) Look for His goodness. We also read that God “acts for the one who waits for Him.” (Isaiah 64:4) Believe that He’s working behind the scenes. And just when you think you can’t wait much longer, our God promises renewed strength during the wait. (Isaiah 40:31) Trust Him for His strength. Our God is not in a hurry. So if you’re waiting for Him now – or the next time you wait – ask Him to turn your wait into a positive experience. Then relax and let Him do what He promised to do. It will be well worth the wait!